The home and commercial work table, constructed from 18-gauge stainless steel, is the perfect wash, prep, and cooking table for multiple purposes and settings. Our product is NSF certified, meeting strict standards for public health protection and safety. Built for quality, sturdiness, and durability, it can handle high-volume and has an extra heavy-duty top. This indoor and outdoor work table is premium quality so it should last a lifetime. No matter what messy projects or hobbies you love to invest time in, this table can handle any wear-and-tear. Because it's industrial-made, surface imperfections such as scratches, scuffs and dents may be found. This is normal and to be expected on products of this nature. FOOD SAFETY: The stainless steel prep and work tables are ideal for meal preparation, in both commercial spaces like restaurants and personal use in homes. Easy to clean and sterilize, metal prep station tables are superior to wood or glass. Food and liquid won't get stuck or ruin the integrity of the surface. Easily wipe away excess food with no fuss, mess, or contamination. Our tables are NSF approved so it meets strict public health standards and regulations. WORK SAFETY: Constructed from 18-gauge stainless steel, this restaurant prep and serve table is durable with a galvanized under-shelf for storage and adjustable legs for convenience. This island table is specifically designed and finished for use in a commercial or industrial setting, but is just as reliable in the home. Designed with high-quality as our standard, this professional kitchen prep station can handle anything you throw at it and will last for years to come. SIMPLIFY YOUR ROUTINE: Any chef knows that efficiency smoothness to execute a great meal in a short period of time relies heavily on reliable products that are easy and simple to use. When you're busy, you don't want to mess with a bunch of bells and whistles. You need kitchen that is easy to move around in when you're busy. Drawers, hooks, and hard-to-reach spaces can ruin your flow. Simple in build and looks, this stainless steel prep station is designed for function and easy access. EASY ASSEMBLY: Any time you spend in the kitchen should focus on your craft, not the stuff on which you make it. We're all about simplicity at which is why we created this stress-free assembly workbench. Assembly of our product includes a table top, undershelf, four legs, screws and an L wrench and can be put together very quickly. With adjustable legs and feet that can be attached to wheels, this product is easy to put together, take apart, and move around. NOT JUST FOR THE KITCHEN: While we pride ourselves in making a high-quality kitchen food prep table, this product can be used for a variety of things. It can double as a garage workbench, a tool bench, a garden or outdoor work bench and table, or design table for blueprints or architectural planning. It's great for home projects like sewing, laundry, or crafts and can even be utilized in cafeterias, janitorial rooms, hotels, office buildings, hospitals, veterinarian clinics and more. View More In Worktables & Workstations. If you have any questions about this product by IYQ, contact us by completing and submitting the form below. If you are looking for a specif part number, please include it with your message. 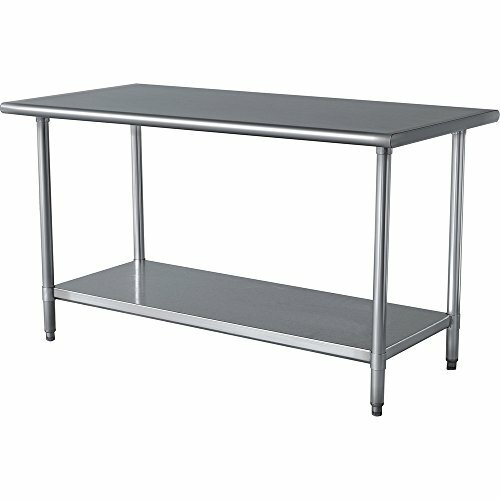 WORK TABLE FOOD PREP WORKTABLE RESTAURANT SUPPLY STAINLESS STEEL 14" X 30"